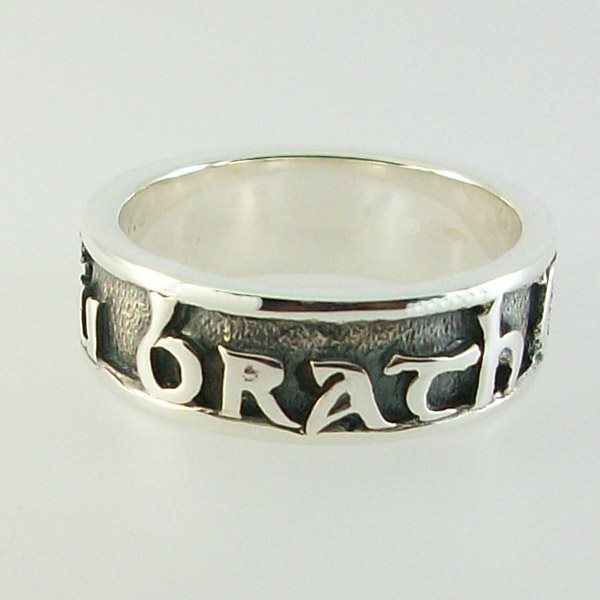 Scottish gaelic phrase Gu Brath(pronounced Goo Bra) is enscrypted into our celtic design band. Scottish Gaelic ring created by John M Hart hand crafted in the Outer Hebrides. Thanks for our beautiful rings.We received them and were so happy at quality and craftsmanship and prompt service. After falling in love with the Islands of Scotland last year we decided that a Celtic/Gaelic theme would be a lovely way to celebrate our anniversary. We settled on the idea of rings and really wanted to support a business local to that beautiful area, your jewellery caught our eye. We chose the "Gu Brath" ring for myself and the "Iona Ring with Amethyst" for Sara. It was no surprise when I opened these this morning to find myself gasping at the beauty within. They are truly exquisite and I am so glad I found them. 1 for each, my wife and daughter. Thank You. I shall return. The quality is First Class!Bought two for our 40th,Wedding Anniversary we are both delighted with these Beautiful wedding bands.